VBA Module Object have several interesting methods and properties. 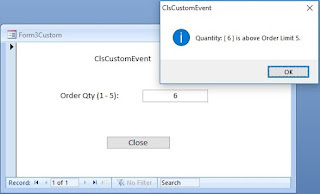 Last week we have seen how to insert a Click Event Procedure in a Form Module with a Function. You can find this blog post here. I don’t say that the frm.Module.CreateEventProc() method, that we have tried, was an easy approach to write a one line statement in a Form Module. But, trying something different is always exciting in programming like exploring the unknown. After all, it is there as part of the Application to explore and learn. Today we will try an alternative and simple method for the same example we have tried last week. That is to write all the program lines in a text file and load that program directly into the Form Module. Create a Command Button on the Detail Section of the Form. Change the Name Property Value to cmdRun and the Caption Property Value to Run Report. Save the Form with the name Sample. If you have last week’s Sample form then open it in Design View. Display the Form Module, remove the existing program lines and save the Form. Replace the report name "myReport" with one of your own Report Name from the database. Place the cursor in the middle of the Code and press F5 to run the Code. Press ALT+F11 to display the Database window with the Sample Form open. Click on the Command Button to open the Report in print preview. Change the Sample Form in Design View. Open the form module and check for the program lines we have loaded from the vbaprg.txt file.